Cooking dinner in the crockpot again! Found pistachios (dry roasted) at Aldi’s! My weekend alarm clock (Charlie) did not wake me up at the usual 7 am. I was a bit surprised I didn’t wake up myself, because I went to bed before 10. I must have been tired. I did a bunch of food prep (put away broth I made overnight, breakfast sausage, and dinner in the crockpot) before heading to Rochester to see my parents. Planning is turning out to be the biggest key in making these 30 days successful. Panera Salad (romaine, avocado, turkey, tomatoes, bacon) with a squeeze of lemon instead of dressing. Delicious salad without salad dressing – apparently my tastes have shifted! I did not feel like I was starving myself at all! No Exercise, but I’m okay with that. This was dinner. So delicious. I ate it over Zoodles (zucchini noodles) and the kids ate it with whole wheat spaghetti. Maria thought it was great that I put her vegetables right in the sauce! I was just happy that the kids ate it. 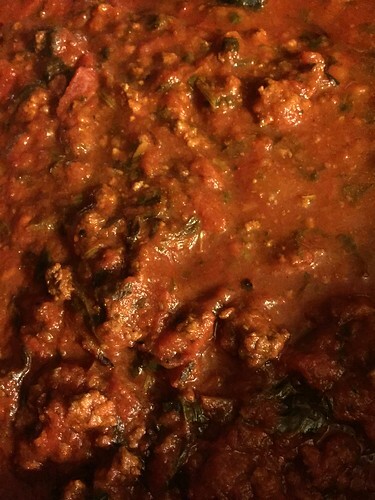 The first time I think they’ve eaten homemade sauce without complaints… plus there was no added sugar. I figured the carrots and the fire-roasted tomatoes would add enough sweetness. PLUS this was totally Whole 30 compliant! the carrots, onion and garlic and sauté until translucent. Add ground beef and cook until no longer pink. Once done, drain fat and then add to a large slow cooker. Add all other ingredients and stir. Cook for 8-9 hours on low. This makes LOTS! It is probably 3-4 meals total. I love having a stocked up freezer! 20 days!! 2/3rds done… if I stop at 30 days. Feeling great, even though I was up late last night finishing Making of a Murderer. Chad had a dentist appt this morning so I couldn’t hit the gym first thing. So I did some yoga and then went after he got home. Romaine with OG-ish dressing – It is too yummy! You should try it! Enough energy for yoga and a run! Another great new recipe – Paleo White Chicken Chili! Still feeling good. Maybe a little bored with my food options. This is where I know it gets tricky… Yoga this morning was a nice meditative stretching session… felt calm and refreshed. Dinner – we were invited to a pizza party. Hmmm… I offered to bring the salad. Found a super yummy compliant dressing recipe, and then ate some chicken before we went. It was a rotisserie chicken from the Target deli… of course it had sugar in it.. but I didn’t eat the skin and figured it was better than pizza or starving myself… could have been worse. Didn’t succumb to a pizza party! Well it was not a terribly exciting day – at least not food wise. But again, Feeling really good. I ran in the morning and I think that always helps my moods too. Leftovers for lunch and dinner… still some in the fridge!